CryoSat-2 is first and foremost an ice mission. However, fast-delivery "Low Resolution Mode" (LRM) data is routinely acquired over the global ocean, and is suitable for a variety of operational ocean applications. NOAA's Laboratory for Satellite Altimetry has been processing level-1B LRM data into a simple ocean wave product since July 2011. Beginning in December 2011, LSA began distributing a retracked daily Interim Geophysical Data Record with 2-3 days latency. This is based on the same fast-delivery LRM data, an MOE orbit provided by CNES, and atmospheric corrections based on ECMWF model grids. ESA, CNES and ECMWF are all kindly acknowledged for supplying the components needed to produce this CryoSat-2 ocean IGDR. This poster describes the flows as well as operational uses of CryoSat-2 data by NOAA and the U.S. Navy. High seas ocean wave monitoring is performed by the Ocean Prediction Center at NOAA's National Weather Service, including CryoSat-2 SWH data. 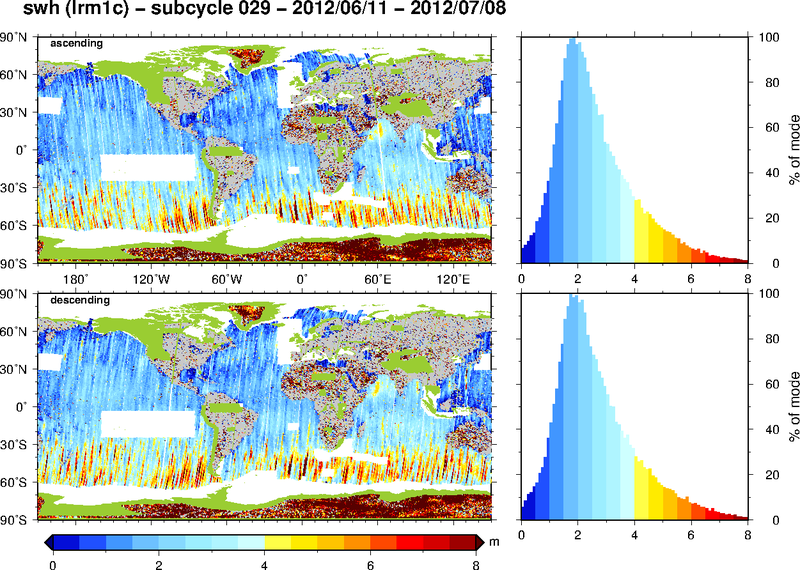 NOAA's WAVEWATCH III® model is validated with altimetry data from Jason-1, Jason-2 and now CryoSat-2. The Navy Coupled Ocean Data Assimilation system (NCODA) is used to initialize NOAA's Real-Time Ocean Forecast System (RTOFS) and is assimilating altimetric sea surface heights from all available altimeters including CryoSat-2. Finally, operational generation of Ocean Heat Content for the Atlantic basin began this year within NOAA/NESDIS, and CryoSat-2 data will be ingested in this system by the end of 2013. OHC is used by the National Hurricane Center for hurricane intensity forecasting via the Statistical Hurricane Intensity Prediction Scheme (SHIPS).